"That's...our galaxy. We're beyond the rim." The Milky Way Galaxy as seen from Installation 00. Intergalactic space is the region of space between galaxies. The volume of intergalactic space is mostly empty and has an extremely low density. In rare cases, naturally occurring objects such as stars may be found outside galaxies. The astronomical objects closest to the Milky Way Galaxy are the two small satellite galaxies known as the Magellanic Clouds, one of which, the Large Magellanic Cloud, was believed by the Forerunners to have been most likely the point of origin of the Flood. The Forerunners were capable of effortlessly traveling into intergalactic space, and even constructed at least two major installations, known as Arks, there. One of these structures, Installation 00 or the lesser Ark, became the site of the final battle of the Human-Covenant War in December 2552. For purposes other than the use of the Arks, the Forerunners rarely ventured outside the margins of the galaxy, as there were no resources of interest. 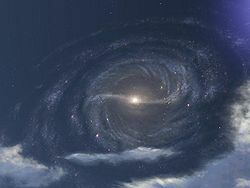 However, in their own prehistory, over ten million years before the Flood's emergence, ancient Forerunners traveled to the Large Magellanic Cloud—known to them as Path Kethona—in the final phase of their genocide of the Precursors. The true purpose of this journey was eventually lost to time and by around 98,395 BCE, a Forerunner expedition crew traveled to Path Kethona aboard the purpose-built ship Audacity in order to find evidence of the prehistoric journey—which had by then been mythologized as an exploratory mission. Nearly 950 years later, the Didact, on the run from Forerunner authorities after his revival from his first Cryptum, had his ship make a series of irregular slipspace jumps to prevent core authority from tracking the journey. One of these jumps led into intergalactic space where the ship entered a long, obscure orbit high about the galactic plane and tens of thousands of light-years from any feasible destinations.